Shower heads can get blocked up and gunky over time. Don’t worry, there is an easy and inexpensive way to clean a shower head using natural products located in your home. Put 1/3 cup of Bicarb of Soda and 1 cup of White Vinegar in a large clip seal sandwich bag. Seal carefully as the mixture will fizz and bubble once you add the vinegar. 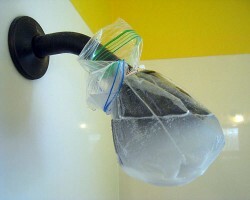 Tie this around your shower head (see photo) and leave it overnight. Rinse off and wipe clean. Do this every 3 – 6 months to maintain a good water flow and appearance! 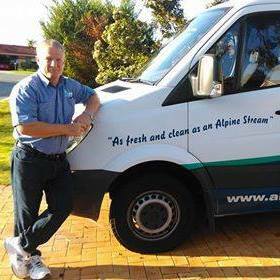 BLOGGER: Paul Mitchell, Owner/Operator of Alpine Shower Screen Cleaning, Perth. Disclaimer: Please note that this and any other tips given in our DIY blog is to assist you in minimizing any discoloration or staining damage. Please follow instructions and measurements carefully as use of different quantities may have unintended consequences. These tips do not take in account individual circumstances, and we cannot be held responsible for any claim or action that may arise from using the information on this website.